Whit Taylor is a prolific cartoonist, creating comics for numerous anthologies and sites like The Nib. While her pieces for The Nib tackle the intersections of race, history, and American politics, in her collection Ghost Stories she turns her attention inward to deliver a series of impactful, personal stories. Early on, the first story, “Ghost,” drives home the themes of the collection. In it, Taylor’s cartoon avatar is visited by a gaggle of ghosts and offered the chance to spend a day with three dead figures of her choice. After agonizing over all her possible options, she decides to go with Charles Darwin, Joseph Campbell, and Marilyn Monroe. The first two ghostly encounters go off without a hitch; Taylor talks about evolution with Darwin while the two of them visit a seussical island of nonsensical creatures, while with Campbell, Taylor muses on how we use stories to make sense of our lives. 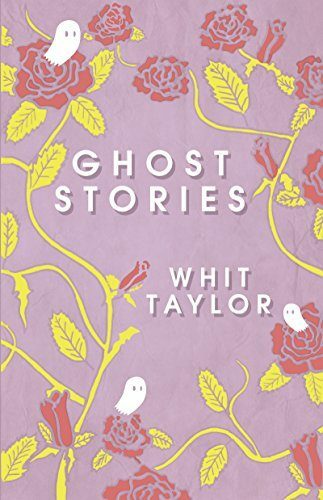 But when the third day arrives, rather than meeting Marilyn Monroe, Taylor is instead confronted with a different kind of ghost—one that makes her reflect directly on her own life. Up until the third ghost, the story manages to be both whimsical and deep. It manages to keep this tone even after it’s revealed that Taylor is a sexual assault survivor. The third ghost turns out to be Taylor herself. This isn’t played as a “gotcha” moment or some kind of twist. Unlike Darwin and Campbell, Taylor isn’t dead but she has lost a part of herself. The comic doesn’t dwell on the assault itself but instead explores what came after: Taylor moving back in with her parents, feeling unsafe in public places, feeling unsafe alone, tentatively starting a relationship with someone new, seeking treatment for PTSD. As she talks it out with her ghostly doppelganger, Taylor manages to end the story on a hopeful note: “I’m not out of the woods yet, but I’m not as scared” (p. 66). For “Ghost,” Taylor does away with panel borders, letting each unmarked panel segment exist on the white of the page. This gives the comic a loose, effortless tone but at the same time each page is meticulously laid out, perfectly balanced even when Taylor throws in charts, diagrams, or blocks of text. The colouring is equally meticulous, and the fact that you can see the individual marker strokes is another touch that makes you feel connected to the creator. Taylor changes things up completely in the next story, “Wallpaper.” Art-wise, it is both the most minimalistic and the most innovative in the collection. On one page is just plain black text, just a few lines describing a specific event in the narrator’s childhood. The following page is filled completely with colour, depicting some kind of pattern associated with that particular memory. The patterns range from tiles to tablecloths to the titular wallpaper. The scattershot approach to the narrative makes the actual story not all that memorable, but the pairing of dry text with vivid imagery does an amazing job of evoking memory itself. We often remember things in fragments, with certain, seemingly unrelated images and patterns acting as an anchor for the rest of the memory. “Wallpaper” is also interesting because it feels like its impact would change drastically depending on the format you read it in. I read a digital version of the collection in a PDF reader set to display one page at a time. Because of this, whenever I “turned” the page and got hit with a blast of colour it was always a surprise, like when a memory comes flooding back. If I had read this in print, or changed the settings so that both the page of text and the page with visuals were laid out side-by-side, the reading experience would have been completely different, and I’m not sure it would have packed the same punch. “Makers,” the third of the three main stories, is in form the most conventional comic in the collection. It has standard square border panels and the story is linearly told. Tessa and Hope are two geeky, creative young girls who quickly become BFFs. As they grow up Tessa tries to keep their friendship alive, even as Hope grows more and more distant. The way their friendship dissolves gradually over the course of the story feels extremely true to life. There’s no big reveal, no direct confrontation; it just fades away. Unlike “Ghost” or “Wallpaper,” which were both full of internal ruminations, in “Makers” the facts are presented to the reader largely without comment from the author or the characters. (There are only a few lines of internal dialogue from Tessa. For the most part, what you see is what you get.) Rather than coming off as cold or clinical, the straightforward nature of this telling makes the story even more heartfelt. Though Hope is depicted as this astoundingly charismatic person, I personally don’t see it. And that’s okay. Lots of people are amazing and desirable when you are under their spell, but seem unremarkable (or at least, not worth all the heartache) to someone outside of the relationship. As Tessa is our point of view character, it’s easy to sympathize with her and be mad at Hope. We’ve all been Tessa at one point, pouring energy into a one-sided friendship, reaching out again and again to be met only with silence. But I’ve also been Hope, moving on rather than reaching back. While our sympathies may lie with Tessa, Hope is never depicted as truly villainous in the story. Early on, the comic gives a pretty clear plausible reason for Hope’s continual reinvention of herself. In one of the few instances of narration, Tessa notes that Hope never seemed to fit in with her mother and stepdad or at her father’s house. As an adult Hope is still looking for a place to fit in, and unfortunately Tessa is just a living reminder of a time and place where Hope doesn’t belong. I’d say “Ghost” is my favourite piece in the collection, but the fact that there’s so much more I could say about “Makers” just shows how much it has packed into it. Apart from the three main stories, the collection also contains a couple of short comics that act as scene breaks between the ghostly encounters in “Ghost.” Like the main stories, they deal with different aspects of loss. The whole collection is very cohesive, even as it approaches the ghost/haunting theme from multiple directions using various storytelling techniques. Though the topics are heavy, they are told in such a lighthearted, kind way that it never becomes oppressive. These “ghost” stories won’t depress or scare you, but they will give you lots to chew on.